The UK’s affluent investors are showing their strongest appetite for fixed income in 18 months, despite the spectre of rising interest rates, according to new figures from independent online matching service findaWEALTHMANAGER.com. 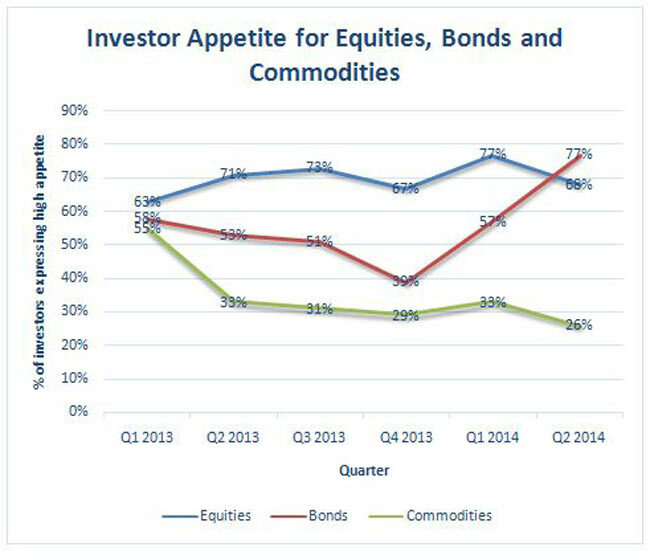 Perhaps even more surprisingly, bond appetite actually outstripped that for equities in the second quarter of this year. In Q2 2014, 77% of findaWEALTHMANAGER.com’s high net worth users expressed a strong appetite for fixed income investments, against 68% indicating interest in equities. What is most intriguing, however, is that fixed income appetite now stands at almost double the level seen in Q4 2013, when murmurs of rate rises first began. Then, bonds were attractive to just 39% of investors yet now – when rate rises are ‘imminent’ and bond fears are really ratcheting up – over three-quarters want to pile into fixed income. findaWEALTHMANAGER.com has surveyed over 1,000 of its users over the past 18 months. While private investors’ appetite for fixed income shot up this quarter to overtake equities, the latter has been the most popular asset class in almost every quarter over this time – reflecting market rises since the start of 2013. Equities appetite has fallen slightly from the start of this year, however, with 77% of investors expressing a strong interest in equities in Q1 and this falling to 68% in Q2. This is drop is synchronised with market movements in 2014 and demonstrates how closely investors are watching the financial news. Looking to alternative asset classes, it seems that gold and its commodity peers have really lost their shine with private investors over the past 18 months. In the first quarter of 2013 55% of users were strongly drawn towards commodities but now this level of interest has almost halved to stand at 26% for Q2 2014. While appetite has been volatile over the period, investors have been consistently more interested in hedge funds than in commodities. 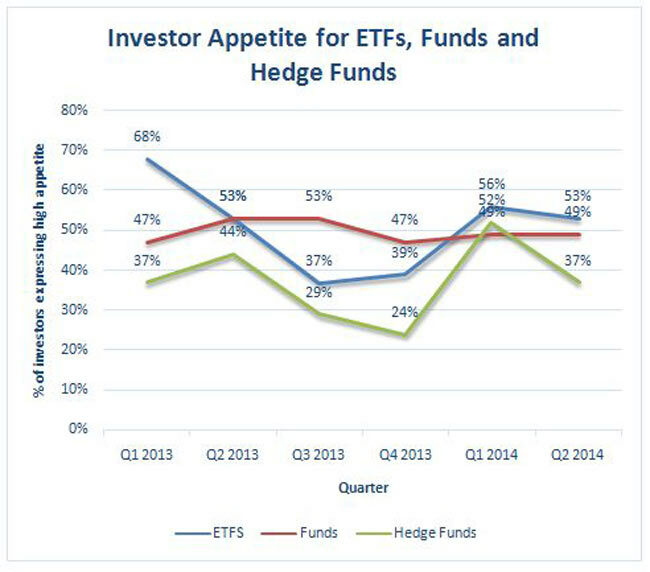 Hedge funds have yet to match the popularity of funds and ETFs, however. These asset classes have been in close competition over the past year and a half, but the 2014 market rally has seen funds make a strong come-back.